Cubadisco Awards 2013 confirmed the value of dedicating the event to music and is ready for its 2014 edition. 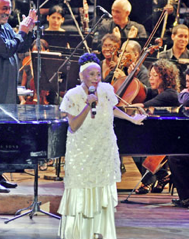 Over two hours, the audience found the interpretive mastery of various artists, including Omara Portuondo, trumpeter Sanjudo Fadev that performed an impressive version of Rhapsody in Blue, Gerhswin. Learn more about the gala on Granma.com.